« Day 469 In Beijing: The Grand Bazaar, Part 2. And, as mentioned before, the desserts were to die for. Jill and I have a Carrefour near us in Beijing. If you don’t know, and if you are from the USA you probably don’t, Carrefour is a French supermarket. They actually have about 3 or 4 here in Beijing and we love going to them because the food is fantastic and they have an excellent selection of wines. They are actually the 4th largest market conglomerate in the world. One of the other reasons is that they have an “all you can drink” 4 day wine tasting party every 6 months. The latest one was just in April and we met a bunch of wine makers, mostly from France, and partied with them for about 4 days straight. Although, after 4 days of partying, we were pretty crooked and straight it not the word I’d use for any of us. Anyway, Andac lives right near a Carrefour and we decided to stop by and pick up some wine, cheese and bread for our dinner one night. 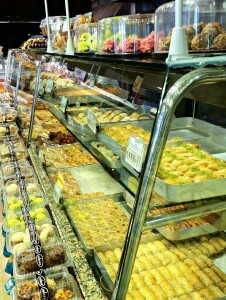 We also bought some desserts as the Turkish desserts are out of this world. Baklava is a famous one but there are so many and they are all amazing. Just so you can see some of the delights that we had to choose from, I took some pictures. If anything catches your fancy, let me know!